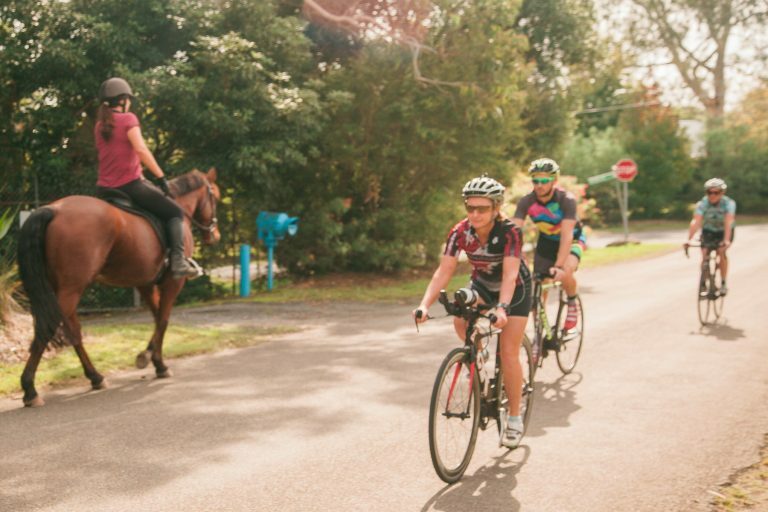 From kangaroos, wombats and possums, to cattle and sheep, there are many animals to be aware of when riding. Their spontaneous nature, makes them unpredictable, making it important to ride cautiously when cycling in these areas. Do your research. If you are planning to ride across a long stretch of open road, particularly in rural and remote regions, you are more likely to come across some wildlife and livestock. We suggest you visit BioNet, where you can discover recorded sightings of animals across NSW. The Office of Environment and Heritage also has some more information that can be used. Pay attention to warning signs. If there are animals located in a certain region, there will often be warning signs along the road. The signs are there for a reason - pay close attention to these and anticipate that an animal could pop out at any time. Look out for roadkill. The sad sight of roadkill on roads can act as another indicator of animals in the area. Not only should you use this to anticipate potential interaction with them, but it is important to observe so you can avoid a potential accident or injury by colliding with a deceased animal. Don’t panic. If an animal happens to be within range, don’t panic. It is important to remain calm, so yourself, the animal and others potentially around you can remain safe. Slow down steadily and observe the behaviour of the animal. Swerving around it, screaming or physically trying to move the animal can put yourself and others at risk. You should keep your position, chime your bell and move past the animal in calm and safe manner; observing traffic conditions around you is also essential. Planning ahead, being observant and remaining calm are three essential things to do when it comes to interaction with animals when cycling. Magpie season, typically ranging from late August to late October, can be the most traumatic time of year for pedestrians and cyclists alike. It is the time of year - mating season for this bird - where they become aggressive and commonly swoop all who walk or ride past. They attack out of efforts to protect their offspring, perceiving anyone in their ‘territory’ to be a threat. Unfortunately there is little that can be done about this, however there are a few theories about how to minimise the impact of a magpie swoop. Where possible, engage in eye contact. Magpies are thought to be less likely to attack if you have eye contact with them. Obviously this isn’t always easy when riding a bike, so printing or pasting eyes onto your helmet is a common tactic that cyclists turn to. Walk away from a magpie – calmly. Walking away quickly but calmly is more likely to get them to leave you alone than running away or waving your arms about. Acting in a panicked manner could be perceived as an attack. Pedestrians could carry an umbrella. Yes this might seem quite drastic, but an umbrella could be seen as a good source of protection. Don’t use the umbrella as a weapon - simply consider it as a mode of protection from being attacked. Do your research. As with animals, knowing where you are at most risk of being swooped will be great preparation before you head out on a ride. 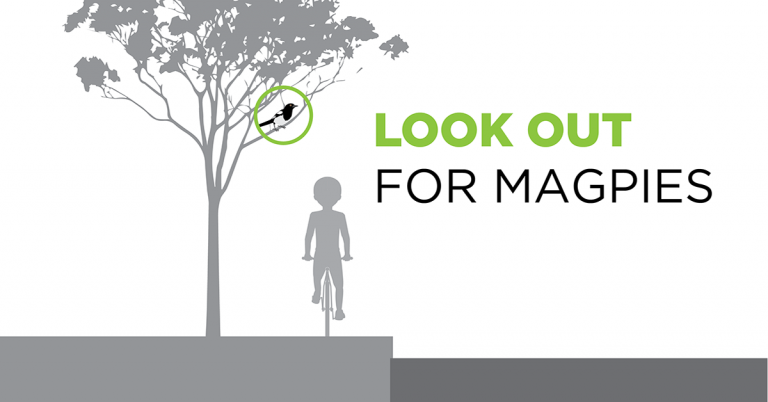 Visit the magpie alert page to identify places where you are most likely to be swooped. Tips about dealing with this can also be found on that page. Our four legged friends are known to be one of the most loveable animals, however dogs aren’t always man’s best friend for bike riders. Change your route. Dogs are an animal of habit and familiarity. Making a few slight deviations on your route to take a dog into unfamiliar territory could be another way to lose it. They will likely turn around and head back home if they are confused with their surroundings. Ride in groups. If you are aware of a dog(s) who could give you some trouble on your ride, think about riding in a group. It comes down to safety in numbers - if something does happen to go wrong, your riding friends are there to help out if needed. Put the foot down. If you are in no way putting your own safety or the safety of the animal in danger, consider riding your bike as fast as you can (within reason). Riding at top speed could make it too difficult for the dog to keep up with you, and you will ultimately leave it behind. Take action. If you do happen to be attacked by a dog, ensure you take the right steps afterwards, to not only protect yourself but others. Make sure you seek medical attention if necessary, and report the bite to your local animal authority.